Hi everyone, new guy here and I'm having a bit of bother with an EXOS-1 EQ4 mount. I've got the RA motor kit mounted and it works, but....there is rather a bit of space between the gears. Only the ends mesh, from rough measurements it looks like the motor needs to be shifted by about 1-1.5mm to allow for a full mesh of the gears. And that's the problem; the only way I can see to shift the motor is going to involve removal of material from either the mount or the motor housing. It looks like I could carefully remove the correct amount of material using a sanding block and very careful strokes but I'm afraid of misaligning the RA motor gear. Looks like it would be easier to remove a bit of stock from the mount evenly that it would the motor housing, but I'm loathe to do anything without some research. The only other mount this size I've added a drive to is an Orion SVP and while its motors seem rather crude in comparison the mounting system does permit me to freely adjust the mesh of the gears. Anyone else run into this? Should I leave the thing as is or am I right to be concerned about excessive wear on the part of the gears that is meshing? Or am I missing something, like a way of adjusting the motor inside its metal housing? Can you load up some photos of the area/site in question? This mount looks a lot like a Vixen GP mimic from what I can see on the web, and I am very familiar with the Vixen versions. I can't quite visualize the issue from your description, but could have some ideas if I could see the motor area, the gears, etc. If you have a physical manual, maybe load up scan of the pages dealing with motors. Here is a copy of the manual that has a pretty decent set of pictures. Sorry for the delay, took me a couple minutes to figure out how to add a picture to the post. From the look of it, only the uppermost 1mm or so is actually engaging. Depth of the teeth is about 3mm. I am wondering about adjustments in the clutch.....on the Vixen system, the clutch moves in and out, in parallel with the drive axis...that is the same with this system? Edited by msl615, 22 January 2019 - 08:53 PM. The instructions make the point of only loosely assembling the motor to the mount, meshing the gears and then tightening the motor mount bolt so that they don't mesh too tightly....the opposite problem of yours. I assume you have removed and remounted...any hints in the bolt holding the motor? Is it tight, not loose, the motor is very tight against the body? Can you see any extra metal flashing in the molding that could be an issue? Do you have two motors....one for RA and one for DEC? Same issue if you switch them? The clutch works a lot like the one on the SVP - you loosen that outer knob and then the gear on the inside is free to rotate. 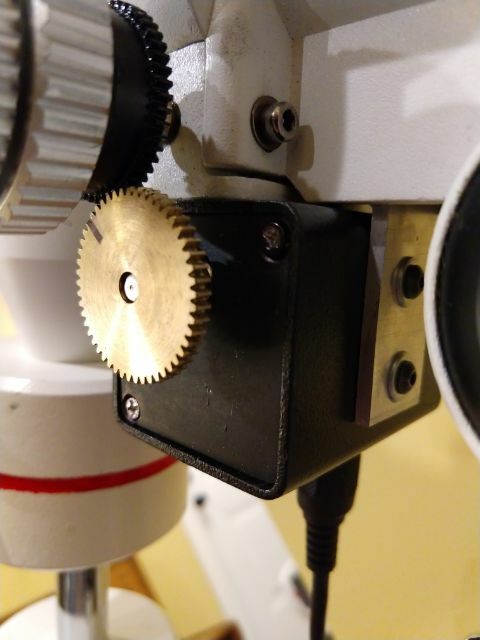 The motor housing is up tight against the underside of the mounting, can't see any way to get the two gears closer except by removing material. Hoping I'm wrong on this. Main thing I'm concerned about is that there is painfully little of the teeth engaging, along with a lot of backlash. 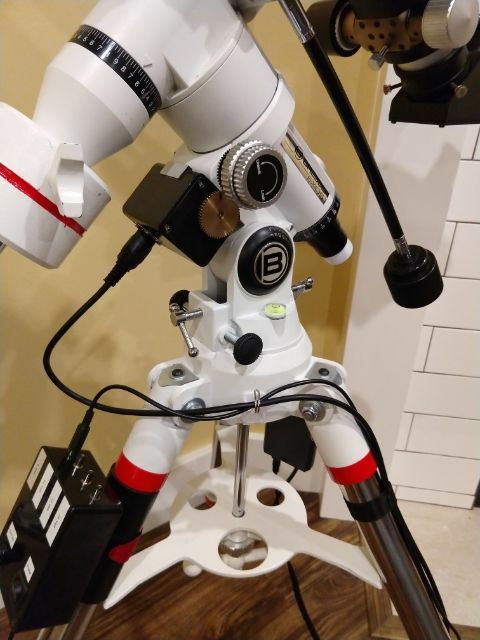 This is still a work in progress but its supposed to eventually be the mount that I use for AP with my 90mm F5.5 refractor so a working RA motor is a must. No dec motor on this one, can't swap. Maybe I should have gone to the EXOS-2, but I wanted a lighter mount than an EQ5 that was more stable than an EQ2 or EQ3. This sucker is rock solid, except for the bizarre issue with the RA motor. I have been looking at my VIxens, and the mounting system is different, so I think I am stuck on ideas. Based on your photo, I agree that such little gear overlap is going to be problem for AP. If you do decide to remove material, I suggest removing it from the motor housing...cheaper to replace if this fails, rather than the mount body. As I think about this, my guess is that the mount itself is the culprit. The 2mm or so thickness on that motor housing cover can't vary much in production. It would have to be almost non-existent to move those gears in closer. Thanks Mike, talking it out with you I think I have it figured out. 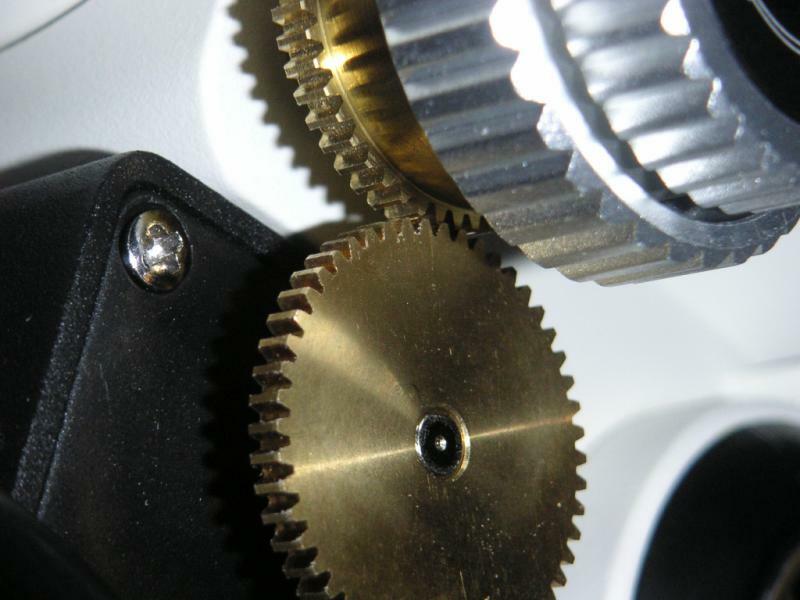 Imagine the two parallel axis of the motor gear and the gear that attaches to the RA slow motion knob. The motor is able to move in a forward-back direction in its mount. As the motor gear moves back the distance between the two shafts increases and the mesh of the gears decreases. As the motor gear moves forward the distance between the two shafts will decrease until the point is reached that the two shafts distance is minimal. I removed the mounting screw and experimented with the motor placement, was able to get a good mesh by going forward a bit. 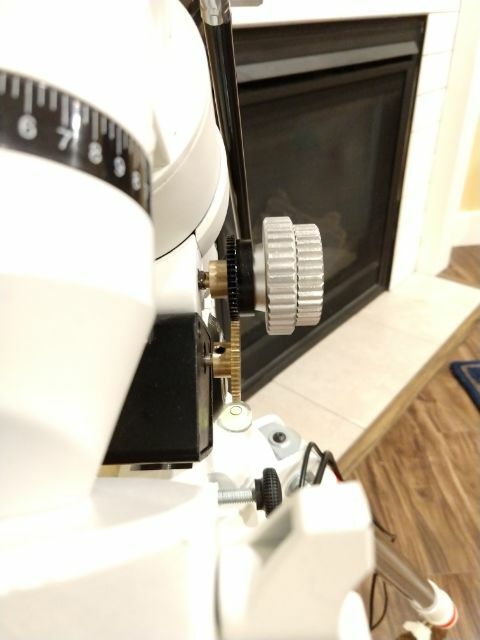 Only problem is that the hole in the mounting bracket for the screw won't quite allow that placement so I think I can carefully hog out that hole just a little to allow the extra travel that will give me the gear mesh that I want. Also thought about building up a pad of JB Weld behind the point where the motor mount screw sits to tilt the assembly forward but I think that allowing a little more motion forward is a more elegant solution. As it is, I gained about 0.5mm of mesh just by moving the motor as far forward in its mount that it can travel. Its better now, but why settle for "better" when you can have "right"? Once I get a chance to tinker further I will post my results. Edited by ReiSen, 23 January 2019 - 10:20 AM. Sorry to say I feel your pain. I have seen several EXOS-1 mounts with the same problem. Looks like the RA drive was at best an after thought in production. I like the EXOS-1 as a welterweight mount but production quality on the tripod and RA drive seem to fall short. Several mods are needed to get the mount to live up to its full potential. One way to overcome the RA problem is shims and elongate the hole on the drive case. The best mod I have come up with is to cut the mount off the RA drive case. Replace it with a pice of aluminum L stock. Sounds scary but if you take your time it works out well. The motor case will need to be drilled and tapped. 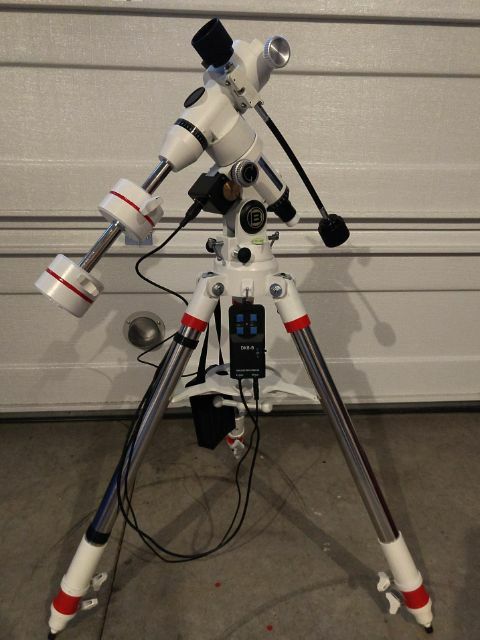 Replacing the mount will also allow you to move the cable hookup out of the counterweight arm path. Here is a picture of my heavily modded EXOS-1. I elongated the hole on the mount by about 1mm and that bought me more engagement, at this point the teeth are over half way engaged. Right now its a whole lot better than it was but I'll see if I can get even better meshing of the gears. Pity about the apparent problem with the EXOS-1 because overall I really like this mount, just the right weight for most of my OTA. Sounds like you are on the right track. Whatever you can do to minimize the slow motion control and drive backlash the better off you will be. Trick is not to create additional drag or binding. Using a run out gauge I have found irregularities in many clutch assemblies and slow motion control mounts. As you near full tooth engagement finding the tight spots becomes more critical. Couple more pictures with the alternative bracket.